Fineberg Management operates a brick apartment property at 1334 Commonwealth Ave., a five-story building of 36 studio and single-bedroom units. It has a buzz-entry lobby system and an elevator. 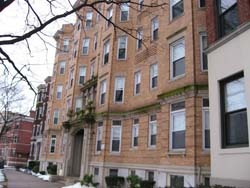 The location is a classic Boston apartment building, with excellent access to the Green Line’s Boston College route as well as the Harvard Street bus route to Allston and Brookline. The location is an energetic cultural and commercial convenience to consumer activities of all kinds.